As I look back in time, I’ve decided the germination of my interest in Oregon’s High Desert began in 1952. Our teacher, Mrs. Ann Briggs brought to school a gnarled and twisted sagebrush sandal on a cookie tray, a fragile human artifact obviously made for a human foot. “No touching,” was her order to our fifth grade class as she carried the tray slowly by each of our desks. And then she told a story of her cowboy brother finding the sandal in a cave in Fort Rock. Her brother never gets a mention in the recorded history of the Fort Rock Cave. Only the archaeologists who claim the find are mentioned, but I believe Mrs. Briggs nonetheless. After all, she had the sandals and the archaeologists didn’t…yet. Sandals from the Fort Rock cave. Courtesy of Oregon Historical Society. I never saw sagebrush sandals again until I walked into The Indian Village restaurant in Lakeview, Oregon in the summer of 1964, the first season of my firefighting days with the US Forest Service. 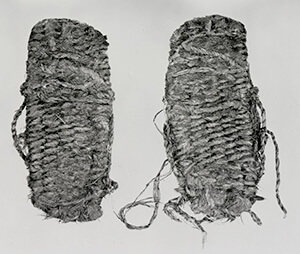 There, in hermetically sealed cases, for all the world to see were sagebrush sandals made by the early people. A little brass sign on the case gave the estimated date of their creation as about 8,000 year ago. I don’t know to this day if those hermetically sealed sandals were the same ones I had seen as a boy, but they could have been. They looked the same, all gnarled and twisted, and they looked somewhat serviceable. On the walls of the restaurant were dozens of big, glass covered picture frames protecting hundreds of beautifully crafted Indian arrowheads, spear points, scrapers, and what I guess to be obsidian knives. I was hooked. Instead of an empty desert, I could envision a land full of people busy living their lives as hunter gatherers. I came tantalizingly close to parting the curtain of time and actually being there, in that place with that ancient person, the watcher, the obsidian napper. The artifacts that once adorned the walls of the Indian Village are gone now, housed in a museum most likely, but the rock at the north end of Abert Lake is still there. Maybe I’ll try that rock again one day, and maybe this time I’ll step back into the world of the Ancients. I really like your story and your way of relaying it. I am especially impressed by the effect your teacher had on you. Thanks for this, Rod! So glad you liked it. The Indian Village is long gone, but the comfortable rock at the north end of Abert Lake is still there. Two people have written to tell me they know exactly where it is. Lovely memoir. I enjoyed sitting with you, knapping obsidian, watching the view. The rock is still there, of course, and still very comfortable. You just provide so many details that I just want to pack up and GO to those sites. I have just finished reading “Spider Silk” about an hour ago and was blown away – I did not expect to enjoy your work so much! I began reading “Stone Fly” immediately afterward, and hope there will be more than five books in this series. Keep up your extremely great work! You are now the third author whose books I save, either on my Kindle (e.g. Victoria Danann’s Black Swan series and offshoots) or in paperback (Nancy Atherton’s Aunt Dimity series), to read again and again. I am not fond of spiders but found one tiny detail fascinating about their webs – that a destroyed web could be rebuilt in one day. I wonder how many other readers caught that one fact. Oh, piffle. I just realized that all my reviews are published under the name of my significant other, John McCormick, since I use his Amazon Prime account to order free books. SIgh. Thanks for taking the time to post such a great note. I’m glad you found Bud Blair, Nancy Sixkiller and the “gang.” My wife and I (along with our three youngest daughters) spent three happy years living in the little town of Lakeview. We spent a lot of weekends exploring Lake County and the BLM and National Forest lands. So when it came time to write the first Bud Blair book, it just seemed natural to choose Lakeview and Lake County as the setting. Novel #6 is in the works, a book with the working title of “Fallen.” Hope to have that one out by the end of the year. Since my earlier comment I have added your FIFTH Bud Blair to my list and hope soon to add more, ONCE they are free on Amazon. LOL. Should I now tell you I found two typos in the second BB book ? Very minor but I am a copy editor always.